The term 'Halitosis', 'Foetor oris' and 'foetor ex ore' are used to describe offensive breath. This embarrassing condition causes social, emotional and psychological anxiety. This article provides an insight into etiology, diagnosis and management of oral malodour. The purpose of this paper is to introduce and review the concept of electroporation therapy In the treatment of head and neck cancer. This is a serious section designed to test your diagnostic skill Periodically we will bring to you clinical and radiographic pictures for you to test your diagnostic acumen. So remember to come back and see what's new In the Grey Area's. Syphilis is a sexually transmitted disease caused by spirochete, Treponema palladium. The incidence of syphilis has greatly increased in the past few years, though oral disease as a consequence of primary syphilis is rare. Extragenital chancres occur in about 5-10% of cases with primary syphilis and may occur as a consequence of orogenital contact. We report a case of 40 year old man, with primary syphilis, who presented with ulceration in the palate and non tender lymphadenopathy. The oral aspects of primary syphilis and the need for dentists to be aware of changing epidemiologic trends are highlighted. Papillon-Lefevre Syndrome is a rare autosomal recessive disorder of Palmoplantar Keratinisation (PPK) in which there is a unique association of the palmoplantar hyperkeratosis and premature loss of both deciduous and permanent teeth. In most cases, the PPK is noted within the first 3 years of life. Usually the patient becomes edentulous by 20 years of age. A case of 13 years old female with AS sydrome is discussed in this article. A 32 years old male reported with pain and swelling in left maxillary region of face since 2 months and painless palatal swelling on left side since 1 year Radiographic features were mimicking a fibro osseous lesion, while CT scan was suggestive of central hemangioma. First FNAC revealed acinic cell carcinoma, whereas repeated FNAC revealed Mucoepidermoid Carcinoma. From postoperative histopathological studies, a final diagnosis of mucoepidermold carcinoma was confirmed. Mucoepidermoid carcinoma is an unusual type of major salivary gland tumor particularly affecting parotid glands; primarily occurs in 3rd to 5th decades of life. Mucoepidermoid carcinoma of minor salivary gland is rare and mostly affects palate. Histologically there are three variants of mucoepidermoid carcinoma. 1) Low grade mucoepidermold carcinoma 2) Intermediate grade mucoepidermold carcinoma 3) High grade mucoepidermold carcinoma. 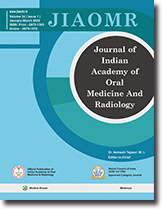 A diagnostically challengeable rare case of "Intermediate Grade Mucoepidermoid Carcinoma" affecting palatal minor salivary gland is presented. Two cases of pemphigus vulgaris in females are reported with special emphasis on role of Oral Diagnostician, Oral Physician & Radiologists in arriving at proper diagnosis and rendering appropriate treatment. The nevoid basal cell carcinoma syndrome (NBCCS) or Gorlin - Goltz syndrome is an autosomal disorder principally characterized by cutaneous basal cell carcinomas, multiple keratocysts, and skeletal anomalies. The major organ systems involved are skin, bones, central nervous system, eyes, gonads and endocrine. This particular syndrome is extensively described in the literature under different names. However, there are only few cases reported in the Indian literature. An unusual case of a 33-year old male with large odontogenic keratocyst involving impacted canine in the mandible, along with multiple cysts and impacted teeth in the maxilla; bifid rib and vertebral anomalies has been described. Eruption sequestrum is an anomaly associated with the eruption of teeth in children. This condition doesn't require any treatment, as it /5 self corrected but awareness of such condition will help accurate diagnosis.